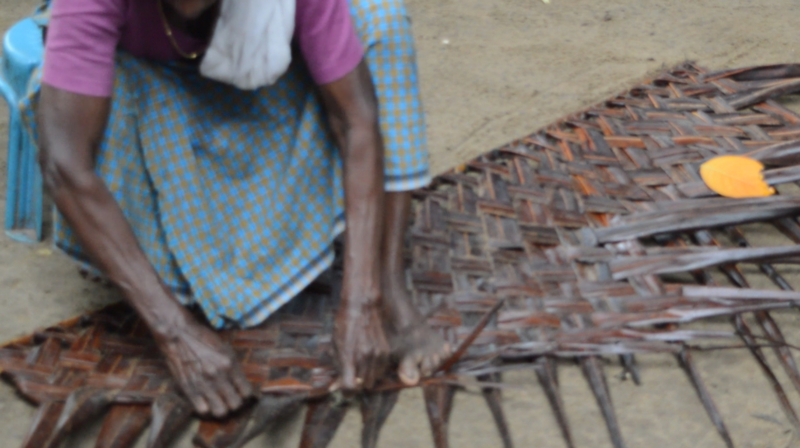 Visiting a local village will give an experience beyond imagination for the tourists who look for some thing different during their trip in Kerala. Why a village? What is special in a village? This will be a question many guest may immediately ask. 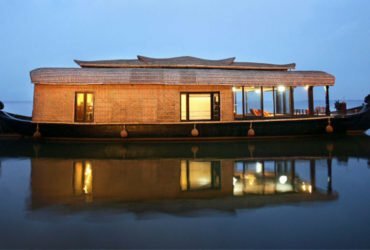 Here, SreesTours.com, A local Kumarakom travel advisor, based in Kumarakom, conducting a daily day tour to experience village Kumarakom. 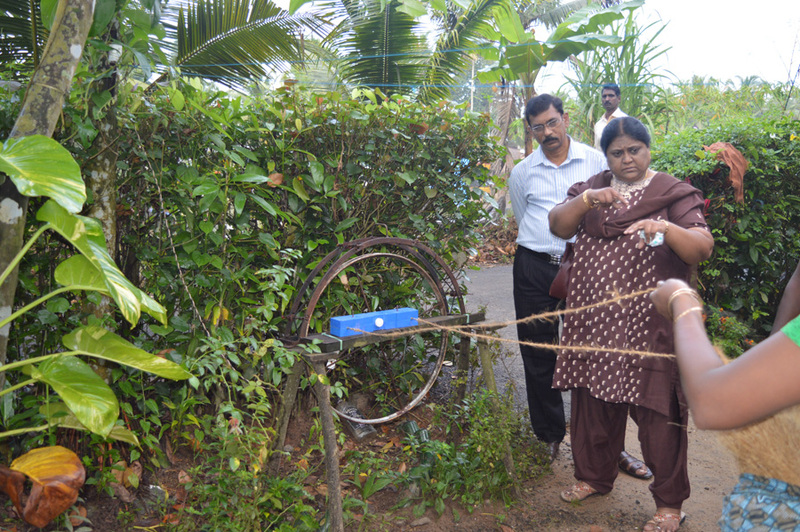 Below are the some of the best and interesting activities one can experience during “Kumarakom Village Day Tour Experience”. Our village experience is starting by a small country boat cruise, with all security precautions, with an experienced local person and guide. 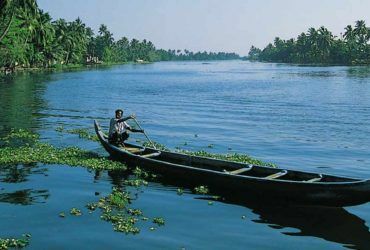 During the 1.5 hrs trip in the country boat, the guest can experience how local people, who have their home on the banks of these canals, use this canal for their daily life, a beautiful paddy field, Toddy Tapping by local tappers, an old women who weaves coconut palm, which is being used for thatched homes and much more. 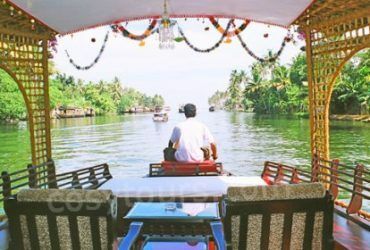 Kumarakom, which is a small stretch of land where one side the biggest vembanadu lake and other side is the canals and rivers which originates at Western Ghats and ends its journey at Vembanadu Lake. Most of the local people are staying on the banks of these canals. The canals are so small, only country boats and small motor boats can be used to cruise in these canals. Though the place can be accessed by small roads, local people still use small country boat or motor boat which is part of their daily life. Since Kerala have plenty of coconut trees, coir is one of the main exporting items from Kerala. 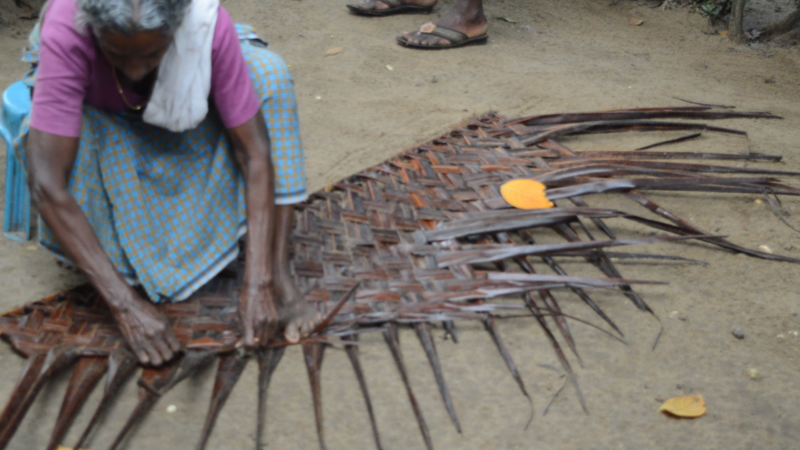 Lots of local house wife used to make coir in their house hold which helps them to earn a small amount. 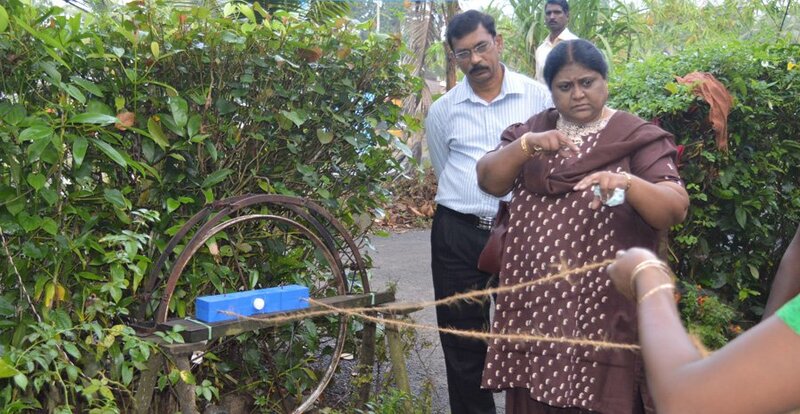 During this trip, the guest has a chance to visit a local village house wife who makes coir for a living. 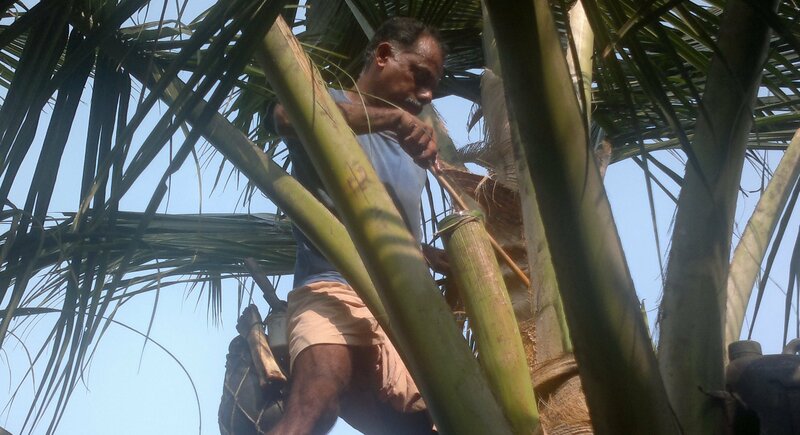 Toddy from coconut trees is being tapped by traditional tappers. 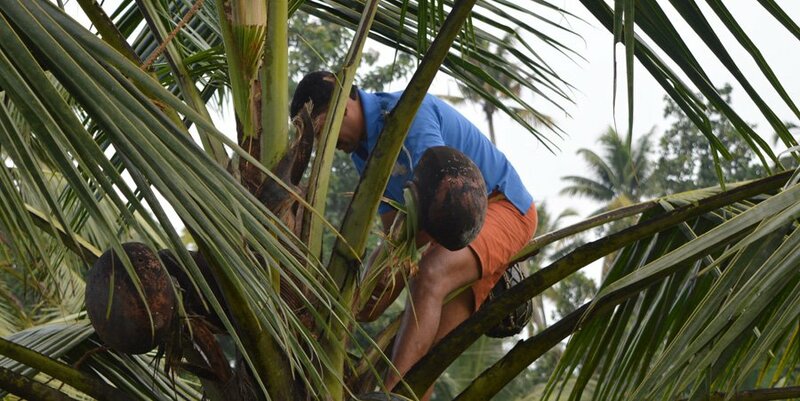 They climb to the coconut tree top every day, slice off a small portion of inflorescence (spadix) apply a kind of clay, wax or leaf extract on it and tie a coconut leaf around the periphery of the cut surface so that the sap trickles down through the leaf to the pot connected at the end. The sap, which is rich in nutrients, undergoes fermentation in the open container. It also gets contaminated by insects, ants, dust particles and pollen. To prevent fermentation, tappers coat the pots inner surface with lime. Thus the sap collected is partially fermented and contains lime and other contaminants. 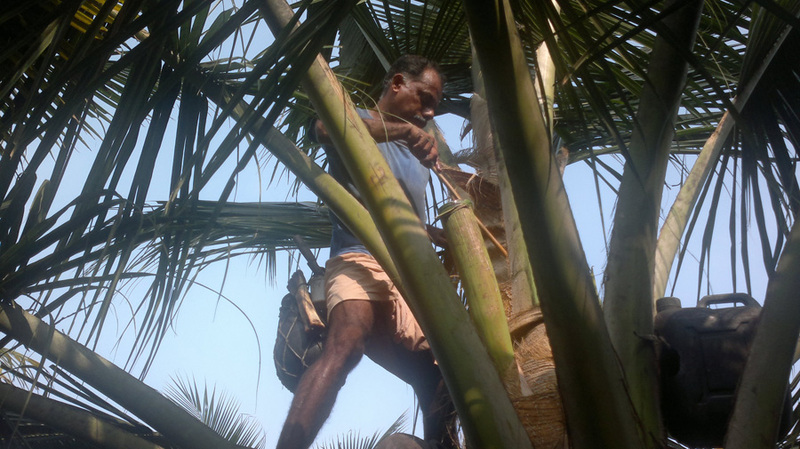 The fresh sap which is tapped from coconut trees is superior nutritious juice to sugarcane or other fruit juices. 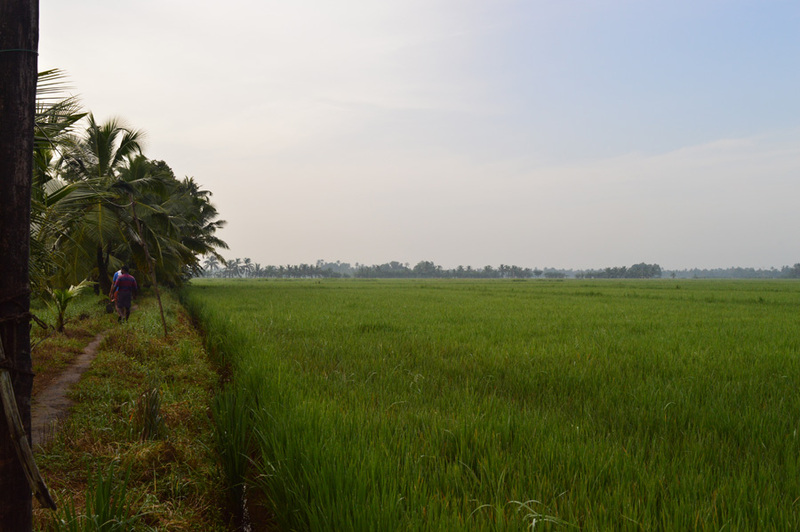 Kumarakom have vast paddy fields where this trip covers. 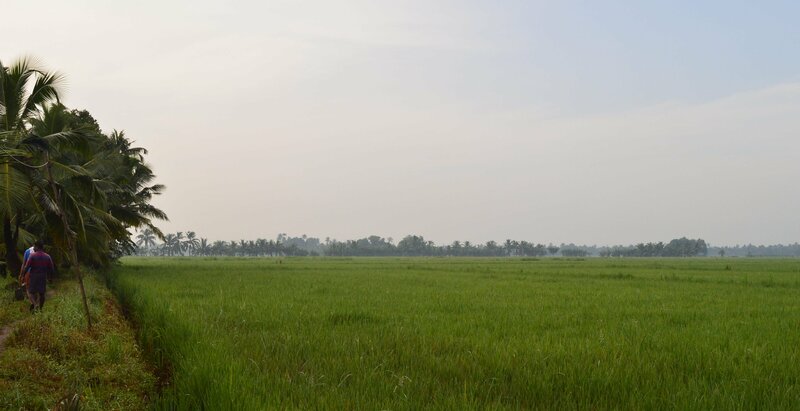 One can have a chance to have a walk on the banks of these green paddy fields. 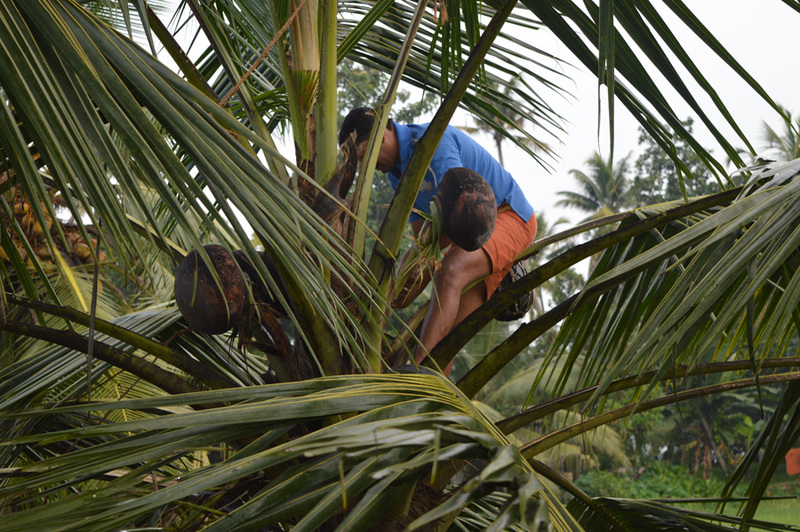 Local Kumarakom people still have thatched homes where the roof is being covered by coconut palm which is available in plenty. 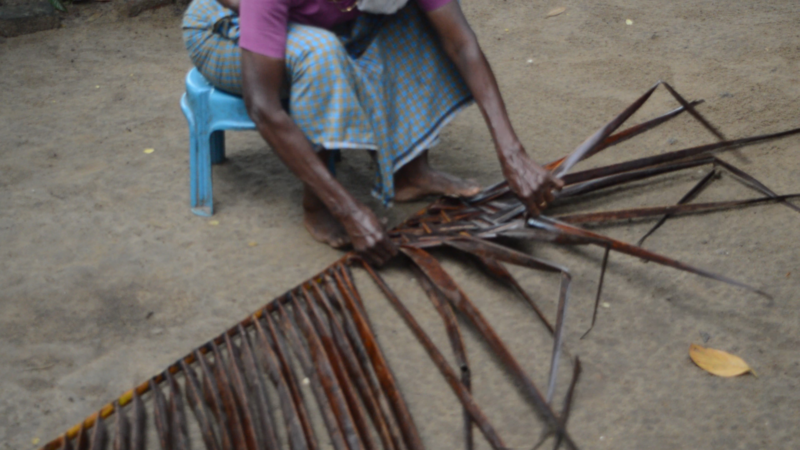 Coconut palm weaving by a local old lady is a good experience to see. The above village experience day tour is not a daily conducted tour and is being arranged on requirement. Minimum one day prior booking is required and minimum 2 adults and maximum 6 adults can be accommodated at a time. Best time of this trip is from 07:00 hrs to 08:30 hrs. There is no trip available either during the day time or evening. Feel free to contact us to book your Kerala trip. A detail of the applicable cost per person is listed below. 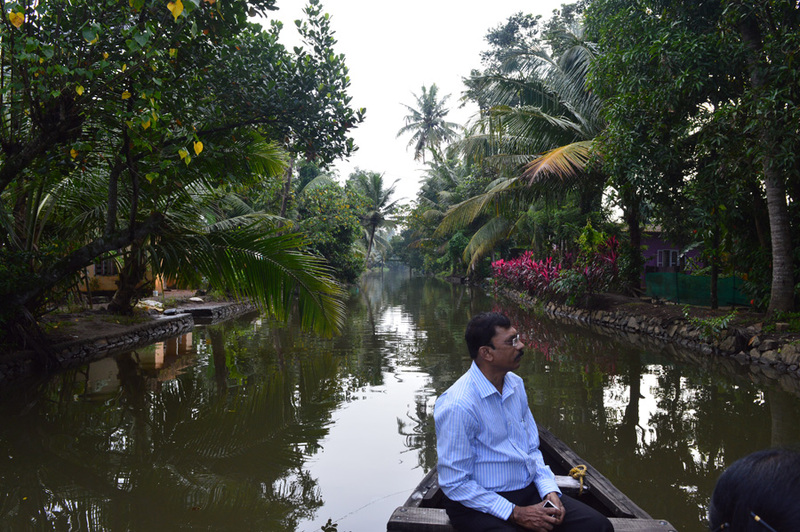 Checkout our Kumarakom Village life experience in this video.